The red-breasted merganser is a decorative bird, with its spiky head crest and contrasting red bill. It dives down to 4 meters to catch fish, using its eyes to find them. The bill with its serrated teeth is ideal for holding onto its slippery prey. It's not hard to understand that clear clean water is very important for the red-breasted merganser. It breeds primarily in lakes in Iceland, Scandinavia and Russia.The nest is well hidden in thick reed vegetation. 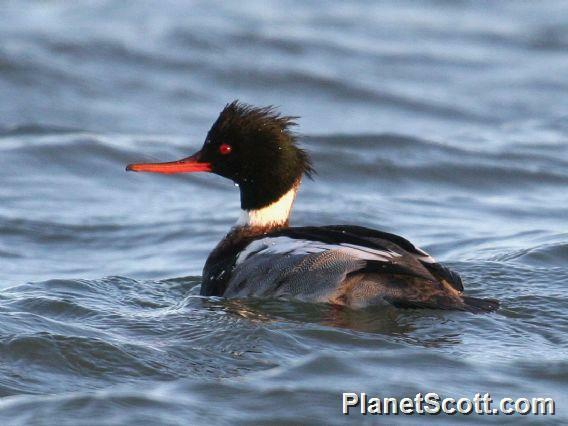 Since the 1980s, red-breasted mergansers have also been breeding in the Netherlands.